Exclusive spaces, rising up to the cathedral. 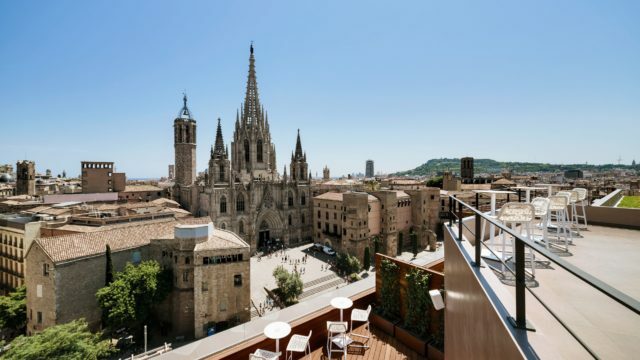 Allow yourself to be caressed by the warm midday sun, or feel the breeze of the Mediterranean sea on a starlight night, depending on the season and each person’s taste, and to do so on the panoramic terraces of the Colon Hotel, is one of Barcelona’s unique experiences. Also contributed to by the amazing image of the cathedral, with its slender towers rising just before us. Or the surprising image, in bird’s-eye-view, of the square which can be seen at our feet, with its many cultural, commercial and festive activities. Or the overall view of the Gothic quarter which spreads before our eyes, with its main buildings, religious and civil, emerging here and there, filled with history…. And if we add the pleasure of savouring a drink and some light conversation in good company, the experience can easily become unforgettable.